The “cliff” is the label given to the simultaneous expiration of the 2001 Bush tax cuts and the imposition of across-the-board spending cuts, as well as a series of other tax and budget measures, including the ending of extended federal unemployment benefits, all scheduled to take effect January 1 unless Congress and the White House enact an alternative. (See: What is the fiscal cliff?). The metaphor has been seized on by both parties and the corporate-controlled media to give the impression that harsh measures must be taken to avoid “going over the cliff.” These measures are likely to center on sweeping cuts in Medicare, Medicaid and Social Security, as well as other domestic social spending, under conditions where the growing social need requires a dramatic increase, not reduction, in the resources devoted to health care, alleviating poverty, and sustaining the elderly in retirement. 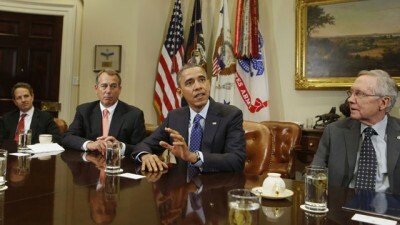 The 70-minute meeting was primarily ceremonial, with Obama, flanked by Vice President Joseph Biden, Treasury Secretary Timothy Geithner and White House aides, sitting down with the four top congressional leaders: Republican House Speaker John Boehner, Democratic House Minority Leader Nancy Pelosi, Democratic Senate Majority Leader Harry Reid, and Republican Senate Minority Leader Mitch McConnell. Held only nine days after a national election that returned Obama to the White House and maintained Democratic control of the Senate and Republican control of the House of Representatives, the meeting was a demonstration of the essential unity of the two capitalist parties when it comes to defending the interests of Wall Street at the expense of the working class. It followed a meeting earlier in the week with union leaders and the heads of liberal, pro-Democratic organizations and a second meeting with the CEOs of 12 of the biggest US corporations. Obama opened Friday’s meeting by emphasizing the bipartisan agreement to extend the Bush tax cuts for lower and middle-income families. “We have to make sure that taxes don’t go up on the middle class, that the economy remains strong,” he said. “That’s an agenda that Democrats and Republicans and independents, people all across the country share,” he said. He said his goal was “to come to an agreement that will reduce our deficit in a balanced way, that we will deal with some of these long-term impediments to growth.” The last phrase is an olive branch to the Republicans, embracing the right-wing claim that the barriers to growth are federal taxes and regulations, not the anarchy and profit-gouging of the capitalist system. Afterwards, the congressional leaders took turns at a microphone outside the White House, issuing ritualistic pledges of good faith and cooperation. The two Republicans, Boehner and McConnell, each declared their willingness to discuss tax increases for the wealthy, as demanded by Obama. The two Democrats, Reid and Pelosi, offered a similar flexibility on cutting spending on social benefit programs, as demanded by the Republicans. Any deficit reduction of that scale would require enormous cuts in Medicare, Medicaid and Social Security, since even a complete scrapping of the Bush tax cuts for the wealthy, as advocated by the Obama administration, at least rhetorically, would net barely $850 billion over the next ten years. The balance of more than $3 trillion would come from spending, the bulk of that from domestic social programs. Last Sunday, NBC News’ “Meet the Press” program posted part of a secret document outlining the Obama administration’s final offer in abortive negotiations with Boehner in July 2011, the first attempt at a “grand bargain” that would have raised the Medicare eligibility age from 65 to 67, cut future inflation-linked increases in Social Security benefits, and imposed other significant cuts in social spending. (See: Leaked “grand bargain” document details Obama’s plan for cuts in entitlement programs). The Wall Street Journal reported Friday that White House officials are in “advanced discussions about a plan to postpone $110 billion in spending cuts,” known as the “sequester,” that is scheduled to begin in January, half of it in military programs. The newspaper said, “The plan would entail a smaller package of spending cuts and tax increases to put off for six to 12 months the cuts that would affect federal spending on defense and other domestic programs.” Congressional Republicans have called for deferring only the military half of the spending cuts. After Obama’s Wednesday press conference, where he said he was “open to new ideas” on the expiration of the Bush tax cuts for the wealthy, a White House official told McClatchy News Service that the administration would consider a top income tax rate of 37 percent or 38 percent for families making more than $250,000 a year. That rate is currently 35 percent, but scheduled to return to 39.6 percent, the level that prevailed in the 1990s, when the Bush tax cuts expire January 1. The US “newspaper of record” all but admits that the 2012 elections were a fraud, a “conspiracy of silence” against the American people, in which not only the two capitalist parties, but the corporate-controlled media participated. All those engaged in hyping the elections as a titanic struggle of irreconcilably opposed camps were aware that as soon as the votes were counted, the two parties would join in a bipartisan effort to dismantle social programs on which tens of millions of people depend.